New to Me Brand!!! Model City Polish! Hello my lovelies! I promised you a post today and I’m going to do a couple of things with this post. One I’m proclaiming my love of indie polish full volume. I trust indie polish, I love indie polish, and I support indie polish makers. Check out the InLinkz below to see a whole bunch of other bloggers who trust indie polish as well! I did tell you that I would not be frightened away and I will not. Also, I’m going to show you a new to me brand today as well! So awhile back in the For the Love of Indies Facebook Group there was a thread asking what brands were on our “Brands to Try but haven’t yet” list. 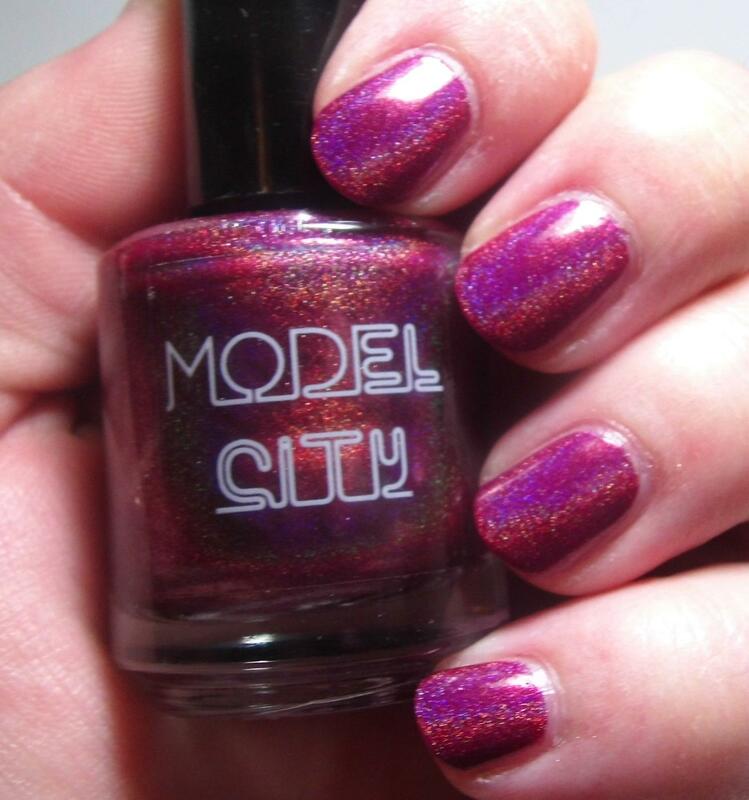 I answered without hesitation: Model City Polish. I’ve long lusted over the gorgeous polishes that this blogger turned maker has been putting out. However budgets and time being what they are I just hadn’t had a chance to turn my hand to acquiring some. Well, Nina, the fabulous maker behind MCP said that everyone needed some MCP in their life and sent me and a few others who had mentioned MCP a bottle of polish to try! This is one of the reasons I love indie polish, makers are interested in what people are saying, they are involved in groups with us, and they are AWESOME. Oh yeah baby. 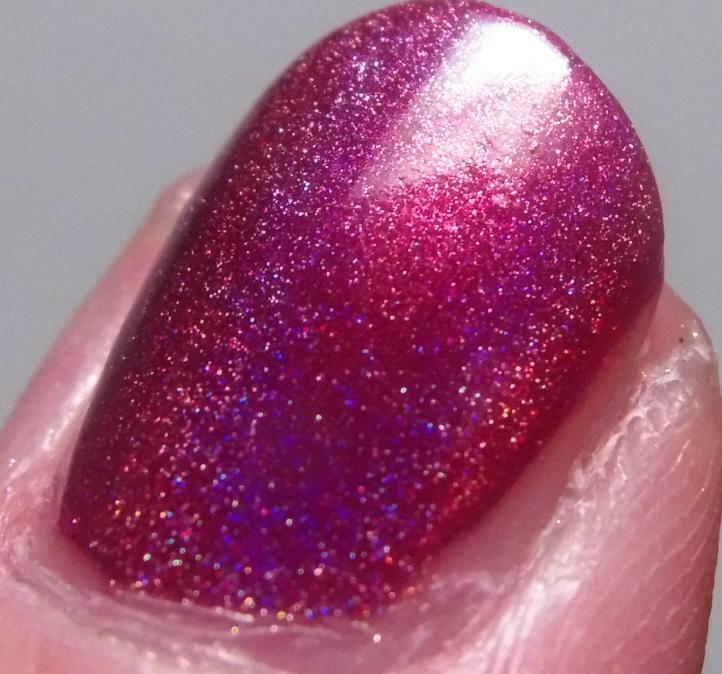 This polish is so gorgeous. The holo is so strong with this one it’s unbelievable. I could not help it I just loved it so much! The color is a beautiful rich wine-red that leans berry-purple. This is just juicy and vampy and will be a recurring visitor on my nails in the upcoming fall season! I mean…just look at how pretty it is. Application was stunning, smooth, even and everything a nail polish could be. No dragging, skipping, or balding here no way! 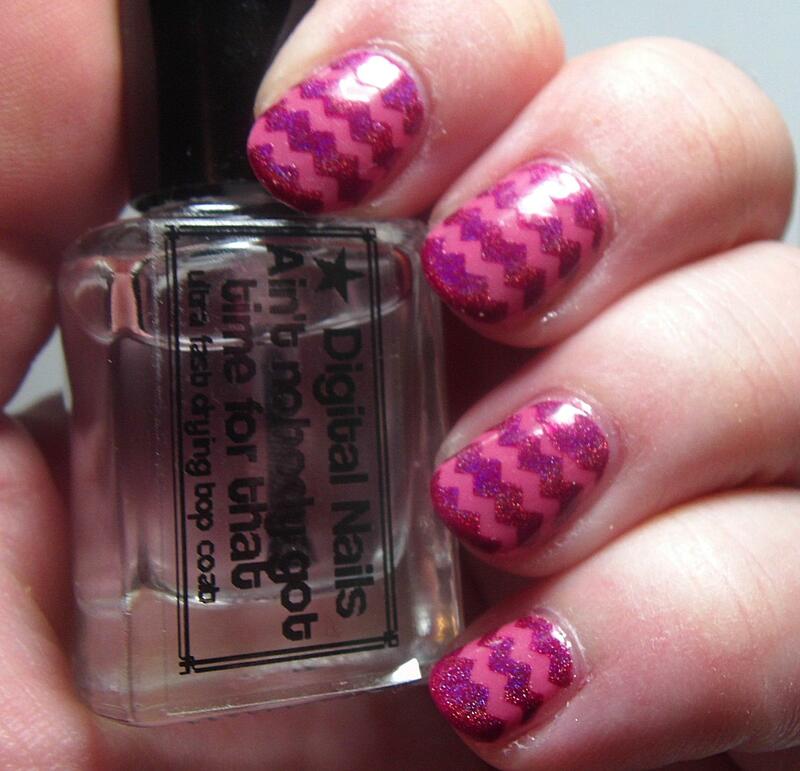 I actually did wear this one for several days after as part of a nail art look and it wore very well. I had minimal tip wear and no chips even after several days. And I have to tell you I’m one of those bad bloggers who don’t wear gloves when I wash dishes and I type all the time and I’m generally pretty rough on my hands and nails. 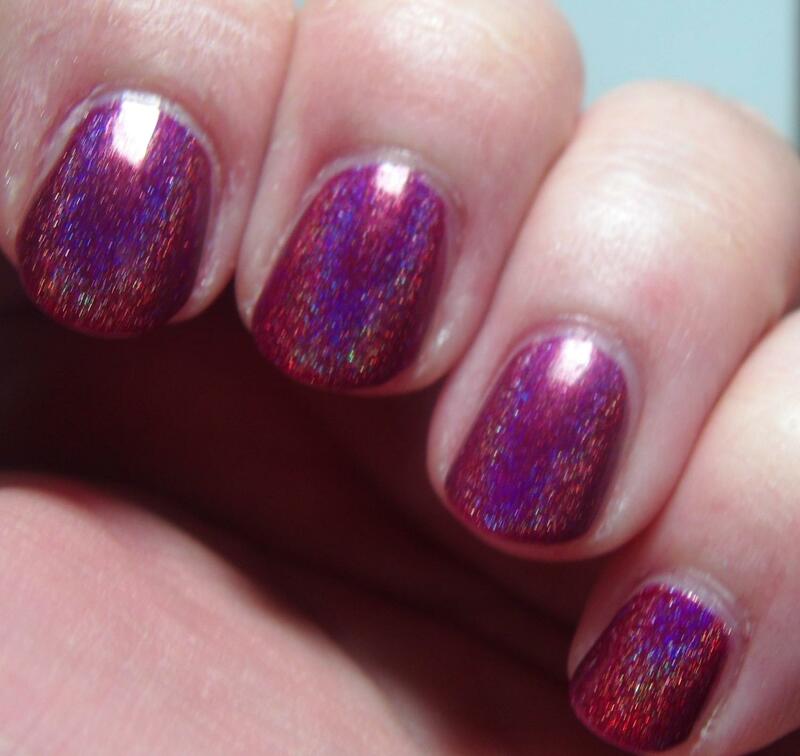 Also topcoat did NOT dull that holo it shone through like a beacon. Oh you wanna see some nail art? BOOM gotcha covered! So first impression of Model City Polish is a great one! You know what they say about first impressions. Not only is Nina super nice but her polish is fantastic. I can’t wait to get my hands on some more of them! Tell me what you think in the comments below…what are your favorite Model City Polish colors?? Also don’t forget to visit MCP on Facebook, Instagram, and check out their Shop to get your own if you haven’t got any already or get some more if you do! Oh, and remember I said she’s a blogger too? Go check out her blog as well her swatches are just gorgeous! Hello my favorite people! I’m sure you’ve been wondering what in the world happened to Boom Shaka Lacquer? Rest assured I have not disappeared, quit blogging, or fallen into a vat of nail polish. No, I just needed to step away for a bit. Things have been incredibly busy for me since graduation. I had anticipated having more time while I was out of school however I just managed to fill up that time with a lot of things that I had been shoving to the back burner for the past few years while I concentrated on school. I’ve been working more hours as well. I’m starting to get into a groove though and so I’m adding blogging back into the mix because I love it and my readers so much! The good news is that I will be back in force very soon (you should see a post from me this weekend for example…yay!!!). In fact, there are a lot of fun things that I have in store for the upcoming year…What’s that? You want to know why I’m talking about the upcoming year when it’s only the end of August? Don’t forget for me my blogging year starts in October because that’s my blogiversary…I’m already thinking about the special celebration I’m going to have for you all! I’ve had a super idea for a fun collaborative project with other bloggers that I hope to get off the ground. I hope to have more about that soon! I’m going to be taking part in a YEAR-LONG nail art challenge…that’s right! I hope that ya’ll will keep me on my toes and keep me focused as I try to keep to the challenge. I want to expand my nail art skills and this seemed like a good way to do it! Are there features or things that you’d like to see me do in the upcoming year? Feel free to comment and offer suggestions. I’m incredibly open-minded and I love to hear what other people think! To address the issue in the indie polish community right now, I’m sure that many of you are already aware of the Mentality Nail Polish issue. This is a very scary situation and my heart breaks for those in the indie nail polish community who have been affected. I feel extremely confident that the majority of indie nail polish is perfectly safe and wonderful. I have been using indie nail polish for over three years now and blogging about it for two years and I have never had a damaging experience. I was lucky in that Mentality has never been a brand that I invested in or used (I think I’ve owned two over the past three years and I used them once each…years ago now) however many bloggers, swatchers, and customers were not so lucky. If you aren’t aware of what’s going on I highly recommend that you read this blog post by Ashley is Polish Addicted it’s a fantastic timeline that is being updated and is by a blogger that I have followed and trusted for a long time. I bring up this issue because it’s important that we all get the word out. There may still be customers who have been affected who don’t know what to attribute their conditions to! Secondly I wanted to make a couple of promises to you. 1. I will never knowingly represent, promote, or review for a brand that is underhanded in their actions or methods. 2. When I review polishes I promise I will be as honest as I can be, yes the VAST majority of my experiences have been positive and I expect that they will stay that way, but I will not hide any issues from my readers if I detect them. 3. I will not be frightened away from what has been the most awesome thing I’ve discovered, indie polish, by the actions and behaviors of one brand. If you are like me and you still love and trust indie polish I urge you to use #itrustindiepolish in your social media posts! So there it is my big long update on what’s been going on, what’s coming up, and my small part to raise awareness of the Mentality issue. As always you are welcome to follow me on Facebook, Instagram, and Twitter. Commenting has been fixed so you should be able to do that as well! Polish on my lovelies, polish on!